Even though opening day of Marvel Studios' Captain America: The Winter Soldier is almost two years away (April 4, 2014), that hasn't stopped one fan from imagining how the movie might appear. 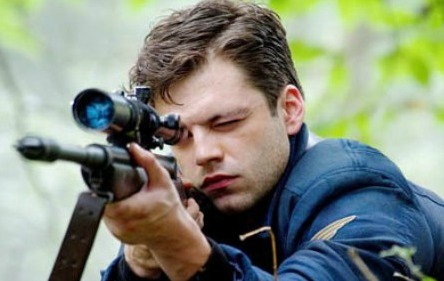 Check out the trailer that a YouTube user made that shows scenes with Sebastian Stan as Bucky Barnes, skillfully spliced with clips from other movies. If you need to be brought up to speed on the Winter Soldier story - in the comic books, Bucky was found in a frozen state of suspended animation by the Soviets and trained to be a master assassin, just like the Black Widow. He has no memory of his past life, so the Soviets send him on a mission to kill Captain America. There's no word from Marvel about how closely they will follow the story in the books, but it's a safe bet that major portions of it will be used in the movie. I like how the fan used dialogue from the comic books in this clip. The script is from a scene in which Natasha Romanoff (Black Widow) and S.H.I.E.L.D. Director, Nick Fury, tell Steve Rogers (Captain America) what they know about the Winter Soldier. Fury: They called him "Winter Soldier". Supposed to be the KGB's secret weapon. Story went that they found him on ice and only woke him up for the big gigs. Natasha: He's very real. He was one of my trainers back in the red rooms. Steve: You can't seriously be implying that Winter Soldier person is Bucky? Natasha: We were hoping you could tell us. You saw him last night. Want to weigh in on this clip or talk about how the Winter Soldier storyline might play out in the Captain America sequel? Tweet me at @capesonfilm or connect on Facebook.